I received some seasoning mixes from Louisiana Grills. The first one I tried was Bacon Hickory. I wanted to do something basic to get a good taste of the seasonings. 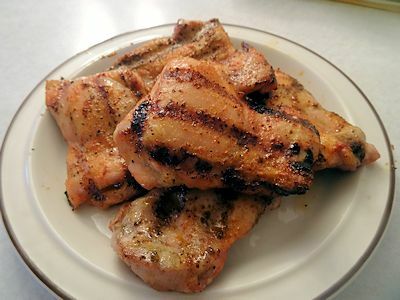 So, I grilled some boneless skinless chicken thighs. I preheated the Louisiana Grills smoker to 450 F. While it was heating, I brushed the thighs with olive oil. I gave a generous layer of the seasoning to one side of the thighs. I put the thighs on the grill with the seasoned side up. I cooked for about 5 minutes and turned. I gave the cooked side a good layer of seasoning and cooked for about 4 more minutes. 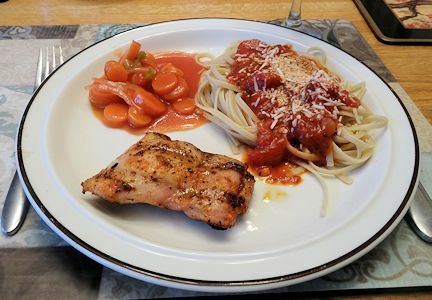 I made sure the internal temperature was over 165 F and served the thighs with Copper Penny Carrots and some spaghetti with marinara sauce She Who Must Be Obeyed made with our home grown tomatoes. This seasoning is excellent. It actually gives a nice bacon flavour and the hickory overtones enhance the grilled taste. This was great with chicken and I believe it would really rock on pork as well. Great recipe! We are happy to hear you are enjoying your Louisiana Grills spices. Thank you! I have tried a couple and they are all good so far. I should know better than to stop by here right before dinner. Now I am starving! From what I see on your site, you make the perfect cures for hunger! That looks awesome! I love chicken thighs and I bet they are delicious with all that smoky flavor! Pinned! It is a nice seasoning blend, thanks.